Our daughter left one of my shovels out in the yard to rust and decay. I'm trying out a quick and easy rust treatment product: WD-40 Specialist - Rust Remover Soak and bringing it back to life. Cutting, Welding, and Brazing Torch Kit , the big, hot Mamma of the Bernzomatic line. I've done recent torch projects with butane (up to 3,150° F), projects with propane (up to 3,600° F), and projects with hotter burning MAP-Pro (up to 3,730°). The Bernzomatic OX2550KC, is the next step up. It uses a dual-gas fuel setup; burning both MAP-Pro and pure Oxygen. This compact, fire-breathing beast can produce a flame up to an incredible 5,300° F! It's not even a commercial tool; it's something you can pick up for yourself at a hardware store or home center. I wanted to try cutting metal with fire. I'd never done anything like it. I think this torch in cutting mode is probably best suited for metal stock, perhaps around 1/8" thick or so. So, naturally, I decided to push well past that on my very first task. I'd been wanting to remove an old, bent fence hinge from our block wall. It was there when we bought our home and has always been an eyesore. The trick would be to cut it off behind the face of the block, so I could patch over it. A reciprocating saw would be difficult to use in that spot. I'd bend the heck out of some blades, chip the wall up, and rattle the heck out of my arms. This torch doesn't work like a standard handheld torch, it takes a bit of fiddling to get the hang of it, but it's incredible when you do. After a little practice, I was able to perform the fine dance of easing more and more gas into the flame, making it hotter and hotter, a blue/white blade of flame. The Bernzomatic OX2550KC Cutting, Welding, and Brazing Torch Kit This is a hose style tool, with fuel cylinders placed remotely, away from the torch head. Starting the torch requires opening the MAP-Pro valve, ever so slightly and using a handheld sparker to ignite it. It takes a different approach, too much gas flow and the flame will go out with a quick blast and a "pop!" Since I'm used to using a standard, handheld torch which can be instantly lit with a hearty blast of flame, it took me a several tries to figure out that I needed to use a very light touch. The MAP-Pro fueled flame needed to be quiet and soft, waving gently like a stick pulled from a camp fire. I learned to ease the MAP-Pro flow down even more, until the base of the flame barely touched the torch nozzle. Isn't it soft and cuddly? Next came the oxygen. Its valve appears to be finely threaded, because you can turn it quite a bit before the oxygen gets flowing. It's great for controlling the release of a very small amount of gas and easing it up slowly. Too much oxygen, too quick, and "pop" out goes the light. In that case, everything has to be shut off to safely start again. Speaking of safety, you'll note I stepped up my gear a couple notches for this project. First,since there would potentially be sparks and molten metal, I wore long pants and shirt sleeves (in Arizona even!). Beefy, long-wristed welding gloves would protect my hands if anything spattered. I capped my natty ensemble off with some Mad Max eye-protection, exchanging my normal safety glasses for a shaded, welding mono-goggle. I wouldn't take any chances with my already crappy eyes and a blinding, white-hot flame. Fire, when you can't see the whites of my eyes. As I slowly eased more oxygen into the flame, it snapped from the slowly waving, orange flame, to a crisp jet of blue-white fury. To cut with this rascal, I had to get it as hot as possible. It took a few tries, but I got the hang of dancing my hand between the MAP-Pro and Oxygen valves, until I got a real tight blast going. With my finely-tuned fire-knife ready, I eased the absolute hottest point up to the metal hinge. The tip of the innermost cone of blue flame was the sweet spot. It was a 1/4" of legendary dragon-fire. I slowly eased the cutting tip of flame back and forth, ever so slightly, watching the metal turn red-hot. Soon, the surface was liquified and starting to flow. I could move a gelatinous blob of molten metal around with the tip of the flame. I was really getting going when the flame died out. Getting the initial feel for working the tool sucked down quite a bit of oxygen. I'd run out, just when I was having fun. I ran out to the hardware store and grabbed another, which was perfect, because they had just finished making the first batch of popcorn for the day. The second time, with the learning curve behind me. I got my flame ripping in no time. I was once again in the molten metal business. As I cut, it seemed like the liquid metal helped accelerate the process, it kept the hinge piece stay glowing hot. The camera, just doesn't do it justice. Even through the shaded goggles, it looked incredible, like a movie scene from a steel mill. It was too fun to be work. I tapped on the piece few times with a pair of pliers and could easily bend it. A couple flaming minutes later, I grabbed ahold and snapped it off without effort. Although the red glow faded very quickly, the piece was still dangerously hot. I could feel the heat radiating from it on my weekend-stubble chin. Even after cooling on the ground for several minutes, it still scorched the board I set it on like a wood burning iron. It was a shame I was done. It was just too much fun. Naturally, the kid in me decided I really needed to push the remaining bit of metal back, just a little deeper into the block face, because,... molten metal! I sparked up some fire again. I really had the hang of lighting the torch by this point, quickly getting the flame into good cutting shape. With the flame concentrated in a recessed hole in the block, it created an oven of incredible heat, liquefying the metal in seconds. The Bernzomatic Cutting, Welding, and Brazing Torch Kit really is a cool tool. I pushed it hard on my first foray, not only cutting, but cutting a really thick piece of metal. I think I may do a more crafty-dude project with thinner metal at some point. I'm also looking forward to using it to try brazing, basically a big-kid version of soldering, to weld metal together. What do you think? Ready to try this powerhouse of flame? I'm really trying to wrap up the work on the front of the house. All that's left is replacing the drip edge that was removed when our predecessors built the dreaded tunnel of doom . I'd also torn off a good amount when I replaced the rotted facia boards. Drip edge is a sheet metal flashing strip that slides under the roofing and over the top edge of the facia. It has a slight kick at the tip that kicks water off, away from the wood to keep water from ruining it. Here's a good look at the old stuff I'd removed a few weeks back when I tore out the facia. You may have noticed, my normal practice is to attack a project in a frenzy like a shark on the scent of blood until about 90% complete. This is normally where my eye wanders and I leave the project, moving on to the next. I don't recommend this, and I don't have any good excuse; I'm just letting you know my style. The problem is that this time it's obvious. not only is there a bright white metal strip missing on part of our roof line, but there's the issue of the remaining shingles not being fastened very well. I'd pulled nails and staples in my demolition. Our area suffered a pretty strong storm last week that uprooted trees and ripped up roofs, even clay tile shingles. We were mostly spared, but there was a little issue with loose edge shingles. I got up early this morning, to beat the heat but couldn't really fire up the air compressor to nail it without waking the neighborhood. At least I could get to the quiet work of measuring, cutting, and dry fitting the edge. This stuff is hazardous. Just touching it, you can feel it really wants you to slide your bare hand along the edge, just once, so it can rip your tender flesh open. It wants to taste blood. I denied myself a trip to urgent care for stitches and slipped on some gloves. I took a quick tour around the rest of the house to see how the existing drip edge was installed around corners and peaks. It's pretty easy with a pair of tin snips. Here's an outside corner. I slipped it into place, under the shingles, overlapping the next piece of edging. In some parts of the country, there's additional steps, such as getting it under the underlayment to prevent ice damming. Nothing we need to worry about here in Phoenix. There were a few missing shingle parts from the storm. Luckily, I still have a scrap pile I can find some pieces to scavenge and cut here and there. In one case, I happened to find the exact missing puzzle piece laying over by the neighbor's yard. I tucked him back in under his blanket, nice and cozy. I'll come back and fasten it later, when I nail in the edge. I got the garage dry fitted and started wrapping around to the front, where the tunnel had been. Yep. I destroyed the blade in a few short minutes. I guess it's a trip to the hardware sto...."Boom!,... BOOOM!,... BOOOOOM! ....BOOOOOOOOOM...."
Someone to the south of us was evidently doing a reenactment of the cannonade, preceding the last charge in the battle of Gettysburg, early Sunday morning, no less. Normally, I'm accustomed to seeing a bright blue beautiful sky over there. A couple more flashes and deep rolling booms re-awakened my long dormant Michigan weather sense. Everything was painstakingly dry fit into place. Shingles and edge would be blown to kingdom come in a storm. It looked like it was going to be a doozy. After a moment of cursing and staring stupidly to the south, I dropped what I was doing and fired up the compressor. I had originally intended to simply tack the edge into place with staples before nailing it with roofing nails and adhesive. I didn't even buy the nails yet. I grabbed the 18GA Stapler , scurried up the ladder, and started rapidly banging away. An adjustment to the depth wheel and it was sinking staples through shingles and edge easily, with the occasional spark from hitting granules. It looked like the storm might just pass to the west. I got the garage face nearly fastened when a big boom from behind startled the absolute crap out of me. It was coming my way after all. The stapler kept its cool and said, "Bang-ity, bang! bang! bang! bang!" getting me nearly to the end for the garage facia before the initial drops, preceding a cold sheet of rain hit me in the back. * Heck, it almost never rains anyway. So much for that. How are your morning plans working out? As we touched up the front of the house (tunnel demo, facia, window sill, lighting, flower bed), it has become painfully obvious that the old address plaque is in dreadful shape. Mr. Sun has toasted it. One more summer will probably do it in completely. An address sign is the house's "Hello" to the world,... or at least to visitors, Amazon.com deliveries, and, God forbid, 911 responders. In our neighborhood, emergency responders have done really well locating targets without using address signs. They've easily located night time emergencies due to the flames engulfing the structures. This inexpensive plaque was one of the first things I had added when we moved in. It was a basic wooden plaque I painted and screwed on metal numbers. Cheap, easy, and effective. Besides the cracking paint and degrading wood, the newly installed light fixtures had a spacial conflict and wouldn't go up until I removed it. So here it's sat for weeks, knee-high to a grasshopper. It's hardly welcoming, barely visible beside vehicles and behind the huge mailbox and palm tree. It's so sad and lonely down there. Finally, the new one we'd ordered online arrived! Sweetie purchased a Whitehall 16"x 9" San Diego Carved Stone wall plaque from PatioSigns.com. This is 100% acrylic; hopefully, it will weather much better than the wood one. It seems like its made out of the counter top material. It's a nice look. The decorative border line and custom numbers are routed, rather than stuck on. The mounting screw holes are countersunk and there is a nice decorative ogee edge around the plaque. After finding an online coupon, she purchased it for $90.25, delivered. It's a custom piece, you get to pick colors and numbers. I feel it was pretty good turnaround, showing up on our doorstep in three weeks. I measured the mounting hole locations and lined it up where we wanted it. I adjusted height to make sure the holes would land on a brick. I didn't want to hit weak mortar and have it blow out on me. Well, isn't this is an unflattering, weak-chinned angle. If you've drilled in brick before with a standard drill, you know what pain it is, even with a fresh masonry bit. A hammer drill makes it downright pleasurable (other than the noise). If you're going to buy a high-end cordless anyway, it's not too much more to get the hammer option. 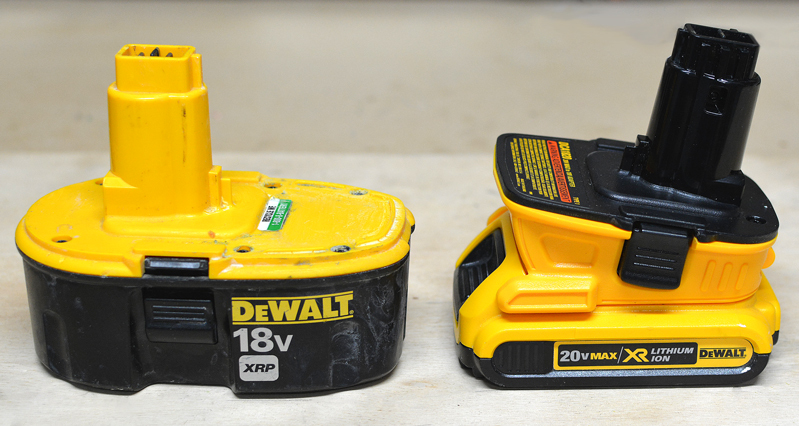 This is my DeWalt 18-Volt XRP in action. It's an older NiCad battery style from my cordless set but is still widely available. Newer, Lithium-Ion versions versions are smaller, lighter, and run longer. 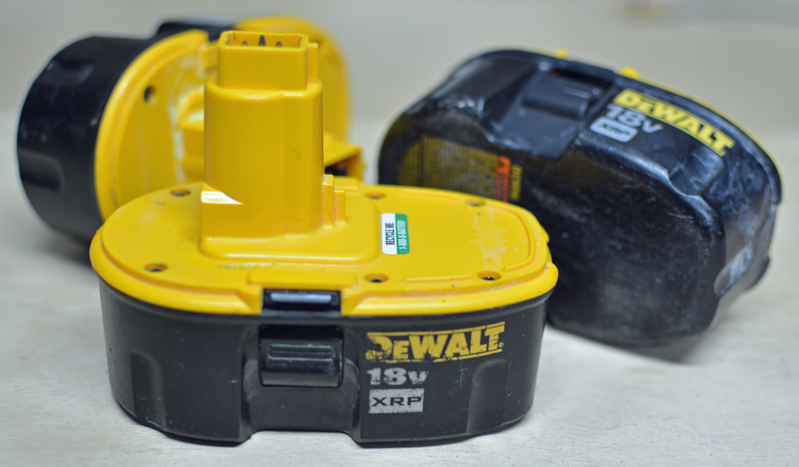 Watch how much quicker a hammer drill works. I start here with normal drilling, then switch to hammer mode (both in the highest speed setting (3)).